For Corey Smale and Tyler Fenwick, doughnuts are more than just food, they are an experience. Smale and Fenwick are co-owners of Strange Donuts, a doughnut shop in Maplewood. 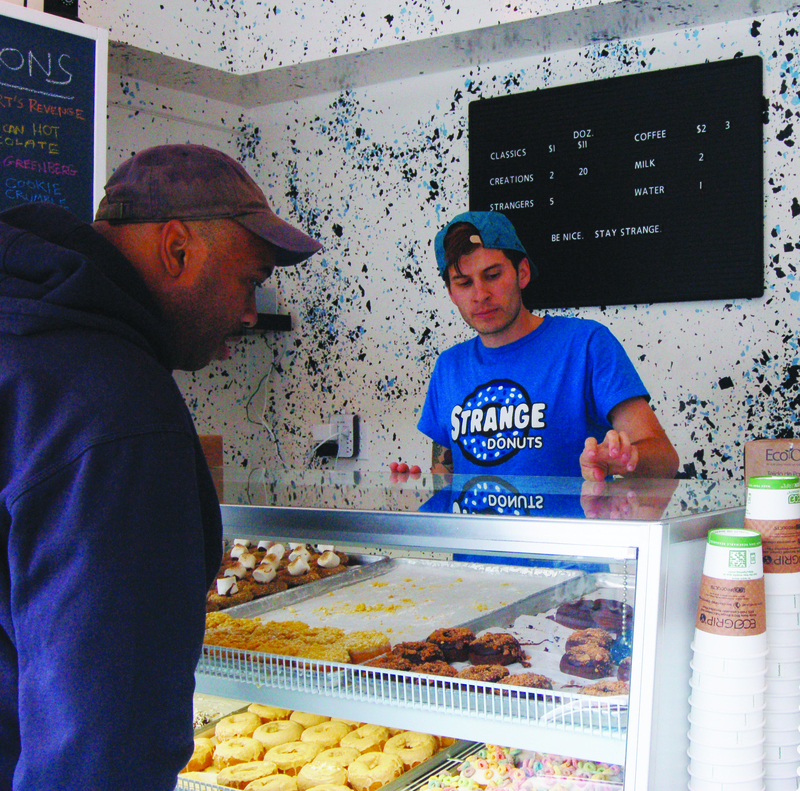 Since the opening of Strange Donuts on Oct. 11, Smale said the shop, located on 2709 Sutton Blvd., has been busy. Despite the long hours, Smale said it is still fun. Both Smale and Fenwick have loved doughnuts for a while. Part of the experience for Smale, is the smell of a doughnut shop. He said every doughnut shop has the same smell. He was worried that Strange Donuts wouldn’t have the doughnut shop smell. Smale and Fenwick noticed a lack of unique doughnut shops in St. Louis. Their love for doughnuts and the lack of creative doughnuts in the area prompted Smale and Fenwick to open the first Strange Donuts. Kevin Chau, a senior biology major at Webster University, has been waiting for Strange Donuts to open since National Doughnut Day on June 7. Chau said he first ate a Strange Donut at a doughnut festival. “The doughnuts were delicious. I had to look them up,” Chau said. Chau said he followed Strange Donuts on the Internet and at their events “religiously” before the opening. Strange Donuts gained community support from a website called kickstarter. The site is a way to find funding for projects. The funding comes from anyone who wants to donate money towards the project of their choice, who are called “backers”. Strange Donuts had 342 “backers” and raised $12,557 on kickstarter.com. In addition to the money, Strange Donuts built a fan base from kickstarter. The doughnut community across the country has also been helpful in the start up of Strange Donuts. Smale said the creative doughnut shops reach out to each other through social media to offer help and advice. Smale said this is where he got inspiration for some of the Strange Donuts creations. Kuva Coffee is also joining in what Chau calls the “doughnut culture.” The coffee company made a special, Strange Donut coffee blend to better compliment the doughnuts. Even with all of the community involvement Smale is just happy to share the doughnut experience. Students talk about their personal experiences overcoming homesickness.